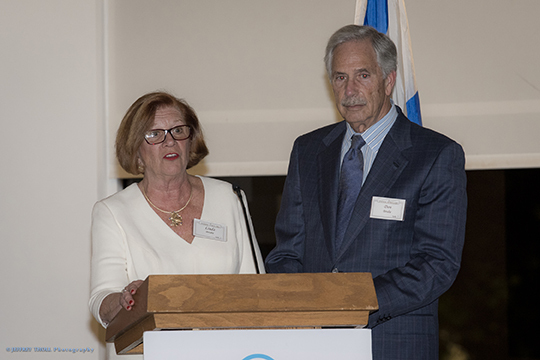 Jewish Federation of South Palm Beach County Gold Coast donors and supporters enjoyed an evening out at Boca Rio Golf Club on February 5. The event featured Dr. Matthew Levitt, Fromer-Wexler Fellow and Director of the Stein Program on Counterterrorism and Intelligence at the Washington Institute for Near East Policy. Dr. Levitt shared his fascinating professional insights on Israel’s security challenges, past and present. Event chairs and hosts Linda and Don Brodie, as well as Gold Coast Leadership Council Co-chair Linda Rosenkranz and Federation President & CEO Matt Levin, also took the stage to speak about Federation’s life-saving work locally and around the world, and to thank everyone for their support. The 2018 Gold Coast Campaign is generously sponsored by the Beacon Palm Group at Morgan Stanley. For more information on Federation, please contact Felice Naide at FeliceN@bocafed.org or 561.852.6084.